Maculelê (Pronounced: mah-koo-leh-LEH) is an Afro Brazilian dance where a number of people gather in a circle called a roda. Regarding the etymology, it seems that macu comes from the Yoruba language spoken by the Nagôs (enslaved black people that spoke Yoruba), while lelê comes from the Malês’ (enslaved black Muslim people who were literate in Arabic) language. 1 During the slavery era in Brazil, the slaves in the sugarcane plantations would gather and play Maculelê as a game to vent their anger and frustration from being slaves. At this time, machetes were used instead of sticks. Sticks were later incorporated for safety reasons. However, some experts still use machetes. 2 There were two tribes in Brazil: a peaceful tribe, and a warlike one. The warlike tribe would repeatedly attack the peaceful tribe, who had no way of defending themselves. One day, during an attack, a young boy named “Maculelê” picked up a pair of sticks and fought off the other tribe. The other tribe never attacked again. The boy didn’t manage to fight them off completely, but did die trying. His home tribe then made a mock combat dance using sticks and named the dance “Maculelê” in his honor and memory. 3 An interior West African village was embroiled in a regional conflict. All of the warriors of the village were called to the front lines to defend their people from invaders. All of the able bodied men gathered their arms and went to join the battle. The next day, the villagers were awakened to find their small village, supposedly far from the battle, was being attacked by part of the invading army. With no warriors left to defend the village, an unlikely hero emerged. A young boy took up two simple sticks and inspired the remaining villagers to mount a fearless defense. His heroic efforts became legend are represented in the Maculelê. Maculelê is sometimes practiced by itself, but is quite often practiced alongside capoeira, and is featured in many capoeira performances. 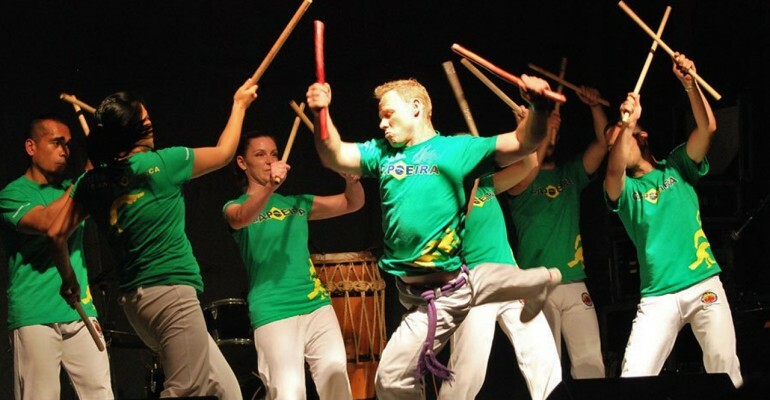 Maculelê and Capoeira are fairly similar in style.